Warm up this autumn (or winter!) with this simple and comforting pork and butternut stew. 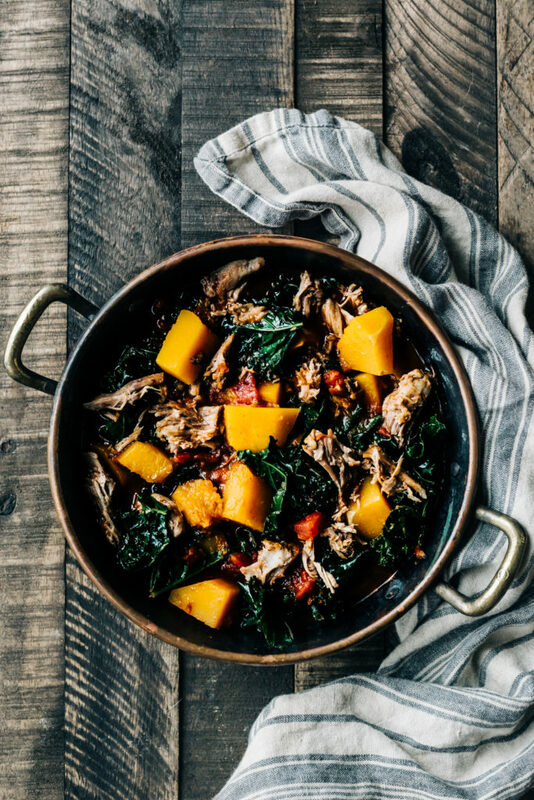 This is the kind of meal that you make when you want your entire house to fill with amazing aromas of slow cooked pork, spices, and sweet butternut squash. We had a fire going in the wood stove when we prepared this stew and our stomachs began to rumble as the kitchen air filled with amazing scents of chili, cinnamon and roasted veggies. This stew takes a long time to cook but the hands on time is really short so don’t let the lengthy cook time scare you off. As we gear up for the harsh season ahead I’m trying my best to make big batches of soups and stews to keep in the freezer so meal time can be easy when we’re in a pinch. I specifically love having leftovers at lunch because that is the hardest meal of the day for us to sit down and actually cook/enjoy. Thankfully, it’s soup season so lunches are made easy with leftovers from a tasty dinner. I was also happy to whip out a jar of canned tomatoes from this season to add to this meal and the results were lovely. This stew tastes best when enjoyed with a good beer and some crusty sourdough bread for dunking. Make sure to get your hands on good quality pork shoulder from a reputable farmer or grocer. It makes all the difference! Cheers to comfort food everyone! Mix the paprika, chili powder, garlic powder, onion powder, cumin, cinnamon, salt and pepper in a small bowl. Add the lime juice and stir. Place the pork in a large Dutch oven or deep roasting pan and coat all sides with the spice mixture. Add 1 cup of water and cover tightly with a lid or aluminum foil. Cook in the oven, turning every 45 minutes. After about 2 hours and 15 minutes, add the butternut squash cubes and 1/2 cup of water. Cook for 30 minutes longer. Add the kale and tomatoes. Place back in the oven for about 15 minutes longer. Remove the pork shoulder from the pot and place on a cutting board. Use a knife of fork to cut/shred it into large chunks. Stir the shredded pork back into the stew. Divide the stew between bowls and enjoy. Just made this and it was delicious! Thanks for the recipe. I made it in a slow cooker because I wanted to start it early in the day. It turned out mushier looking than yours but still tasted great. I lived in the gorge for awhile but just recently stumbled upon your site and have loved reading your descriptions of the fall and winter there. Cheers! To be fair, I started here and made some adjustments. I doubled the meat & rub components and extended the liquid volume and oven time. I also added 4 peeled/halved shallots which got ROASTED alongside the squash on a rack below the dutch oven for the final couple of hours (I think this helped the squash hold up when added to the stew.) I added the tomatoes a little earlier so the acids could work on that extra pork volume, and I also added a can of white beans at the kale phase. What really makes the dish is that pork seasoning profile combined with the sweetness of the big chunks of squash (and shallots, in our case.) Guests LOVED it and wanted leftovers to take home. May I recommend the leftovers re-heated as a rough-chop skillet hash, served under an over-easy egg? Like I said, great stuff!